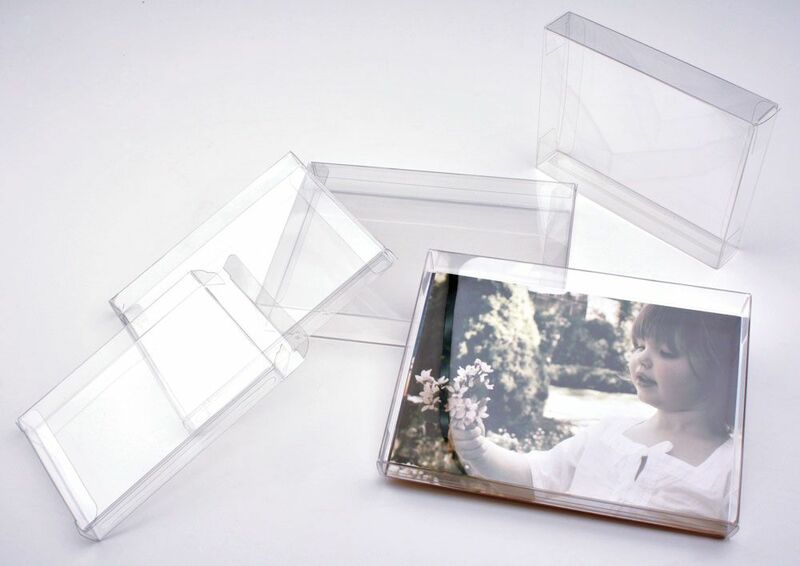 These crystal clear Greeting Card Display Boxes are the perfect choice for retail packs of greeting and note cards with envelopes. They are made from archival, crystal-clear, Polyester. This material is lead and phthalate-free and has an anti-scratch coating. Boxes have a secure closure mechanism and fold together easily. Boxes ship and store flat. Dimensions listed are inside dimensions. Greeting Card Box. 3-3/4 x 5/8 x 5-3/16". Holds 8 sets of 4 Bar cards & envelopes. 3-3/4 x 5/8 x 5-3/16"
Greeting Card Box. 3-3/4 x 13/16 x 5-3/16". Holds 10 sets of 4 Bar cards & envelopes. 3-3/4 x 13/16 x 5-3/16"
Greeting Card Box. 3-3/4 x 1-1/4 x 5-3/16". Holds 15 sets of 4 Bar cards & envelopes. 3-3/4 x 1-1/4 x 5-3/16"
Greeting Card Box 4-1/2 x 1/4 x 5-7/8". Holds 3 sets of A2 cards & envelopes. 4-1/2 x 1/4 x 5-7/8"
Greeting Card Box 4-1/2 x 1/2 x 5-7/8". Holds 6 sets of A2 cards & envelopes. 4-1/2 x 1/2 x 5-7/8"
Greeting Card Box 4-1/2 x 5/8 x 5-7/8". Holds 8 sets of A2 cards & envelopes. 4-1/2 x 5/8 x 5-7/8"
Greeting Card Box 4-1/2 x 13/16 x 5-7/8". Holds 10 sets of A2 cards & envelopes. 4-1/2 x 13/16 x 5-7/8"
Greeting Card Box 4-1/2 x 1 x 5-7/8". Holds 12 sets of A2 cards & envelopes. 4-1/2 x 1 x 5-7/8"
Greeting Card Box 4-1/2 x 1-1/4 x 5-7/8". Holds 15 sets of A2 cards & envelopes. 4-1/2 x 1-1/4 x 5-7/8"
Greeting Card Box 4-7/8 x 1/2 x 6-5/8". 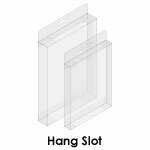 4-7/8 x 1/2 x 6-5/8"
Holds 6 sets of A6/6 Bar cards & envelopes. Greeting Card Box 4-7/8 x 5/8 x 6-5/8". Holds 8 sets of A6 cards & envelopes. 4-7/8 x 5/8 x 6-5/8"
Holds 8 sets of A6/6 Bar cards & envelopes. Greeting Card Box 4-7/8 x 13/16 x 6-5/8". Holds 10 sets of A6 cards & envelopes. 4-7/8 x 13/16 x 6-5/8"
Holds 10 sets of A6/6 Bar cards & envelopes. Greeting Card Box 4-7/8 x 1 x 6-5/8". Holds 12 sets of A6 cards & envelopes. 4-7/8 x 1 x 6-5/8"
Holds 12 sets of A6/6 Bar cards & envelopes. Holds 15 sets of A6 cards & envelopes. 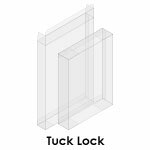 4-7/8 x 1-1/4 x 6-5/8"
Holds 15 sets of A6/6 Bar cards & envelopes. Greeting Card Box 5-5/8 x 5/8 x 5-9/16". Holds 6-8 sets of 5 x 5" cards & envelopes. 5-5/8 x 5/8 x 5-9/16"
Greeting Card Box 5-3/8 x 1/2 x 7-3/8". Holds 6 sets of A7 cards & envelopes. 5-3/8 x 1/2 x 7-3/8"
Greeting Card Box 5-3/8 x 5/8 x 7-3/8". Holds 8 sets of A7 cards & envelopes. 5-3/8 x 5/8 x 7-3/8"
Greeting Card Box 5-3/8 x 13/16 x 7-3/8". Holds 10 sets of A7 cards & envelopes. 5-3/8 x 13/16 x 7-3/8"
Greeting Card Box 5-3/8 x 1 x 7-3/8". Holds 12 sets of A7 cards & envelopes. 5-3/8 x 1 x 7-3/8"